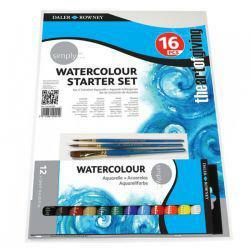 Daler-Rowney is renowned as a world leading fine art material supplier. Their 'Simply' range is tailored to the growing entry level market and is suitable for students and home use. This Simply Watercolour Starter Set is a perfect gift and ideal for beginners looking to start exploring watercolour painting. Good starter kit - dissapointed the A3 board was damaged on arrival. Bought as Xmas gift. Recipient very happy with it.